[Untitled] and the Grind are proud to present Home Game an evening of poetry and prose with music from Adam Stafford on the 27th of November at 6.30pm until 10pm. Home Game will be held in Behind The Wall (Alehouse) 14 Melville Street, Falkirk, FK1 1HZ and tickets are £5 with all profits from the sale of tickets donated to Falkirk Foodbank. Tickets will be available on the door. Created by Craig Allan ([Untitled]) and Gordon Johnstone (The Grind) Home Game features an array of the countries most exciting and virile poets, writers and musicians which no less than five of Falkirk's most successful acts in the line up. Tickets include an exclusive invite to the national launch of Dickson Telfer's second collection of short stories, Refrigerator Cake, published by Fledgling Press. Dickson will be reading from his new book and copies will available to buy on the night. 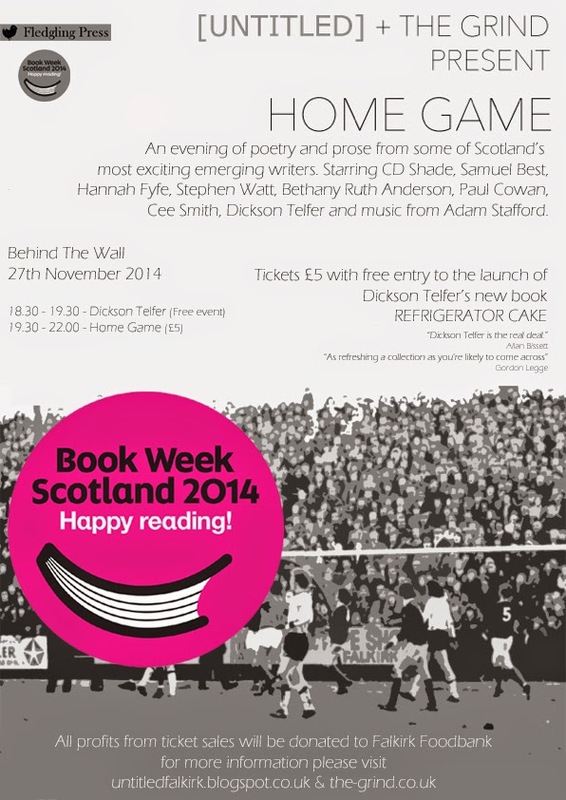 The launch of Refrigerator Cake is a free event and will begin at 6.30pm and will last approximately 1 hour. At 7.30pm Home kicks off with readings from 8 published writers from across Scotland, the line up includes CD Shade, Samuel Best, Cee Smith, Hannah Fyfe, Stephen Watt, Bethany Ruth Anderson, Dickson Telfer and Falkirk's emerging talent and Woo'er With Words favourite Paul Cowan, whose debut collection published by [Untitled] launches in the Spring. Headlining this fantastic charitable night of spoken word will be music from Falkirk's very own multi award winning musician and film maker Adam Stafford. Adam is the former front man for indie stalwarts Y'all is a Fantasy Island and his solo album Imaginary Walls Collapse was longlisted for the distinguished Scottish Album of the Year award 2013. His film The Shutdown a collaboration with Alan Bissett was critically acclaimed and received several awards including Best Short Documentary at the San Francisco International Film Festival 2009. [Untitled] and The Grind are both not for profit publications all proceeds from Home Game will be donated to Falkirk Foodbank. Created by Gordon Johnstone The Grind is a bi annual publication dedicated to supporting writing and visual art from around Scotland. The Grind tweet at @thegrindjournal. All the acts at Home Game are giving their time free of charge to tie in with the ethos as they realise it is an important cause.